Sometimes a good idea is so simple that people can’t help but overcomplicate it. Usually, it goes like this. Some people discover (or rediscover) something and find it is good. Other people also like it, and add their own individual spin on it. A third group of people arrives much later, seeing an esoteric and impenetrable mess of contradictory ideas. It does not have to be that way. A simple sandbox campaign is very easy to make. No matter how much we talk about it, deep down, a sandbox game is just a campaign where the players have a high degree of freedom in influencing the course of events. This freedom is built upwards from the level of individual decisions (“Do we follow the Jarl’s orders or do we betray his plan to the Assassin’s Guild?”) through adventures (“We would like to join the Assassin’s Guild. I bet they pay better. Let’s try to get into their good graces by doing this mission.”) to having a decisive influence over the tone, contents and directions of the campaign (“We would like to set ourselves up as the new lords of Orthil and its mining operations. Maybe we can get our hands on the neighbouring lands too. Let the Jarl and the Assassin’s Guild come after us if they dare!”). A sandbox game means letting loose a bunch of players in the game world to wreck it (or get wrecked by it) at their leisure. By following the three pillars of the sandbox, choices, context and consequences, the campaign grows through interaction. The more the players engage with it, the more depth, details and connections they can uncover. If the party keeps working against the Jarl and the Assassin’s Guild, they will discover their web of influences through the peninsula. If they don’t engage with this element, it remains in the background, in rough detail. The guild is still there, lurking in the shadows, but we need not know about the mysterious lady running it, nor where and how they ply their trade. The Jarl is a name you hear invoked often, but all the characters will interact with will be his soldiers and officials. Ultimately, it is really about letting it go. If the players discard one plotline, come up with another. If they befriend an NPC meant for slaughter, use that NPC for that purpose. If they find the cards turning against them, let them find a way out on their own and back out of the adventure. Avoiding over-preparation is important, but even if you have invested that effort into detailing a bandits’ hideout, the work you did will come in handy later in another context (or maybe another campaign). Some of the most entertaining games I have been involved in were about the GM and the players throwing ideas back and forth, and letting them turn into a complex, interrelated mini-setting: most of this complexity came step by step through exploration and interaction, and some through regular game procedures (such as 1st edition AD&D’s robust and dangerous wilderness encounter charts, or simple guidelines for running out of supplies while exploring the wilderness). 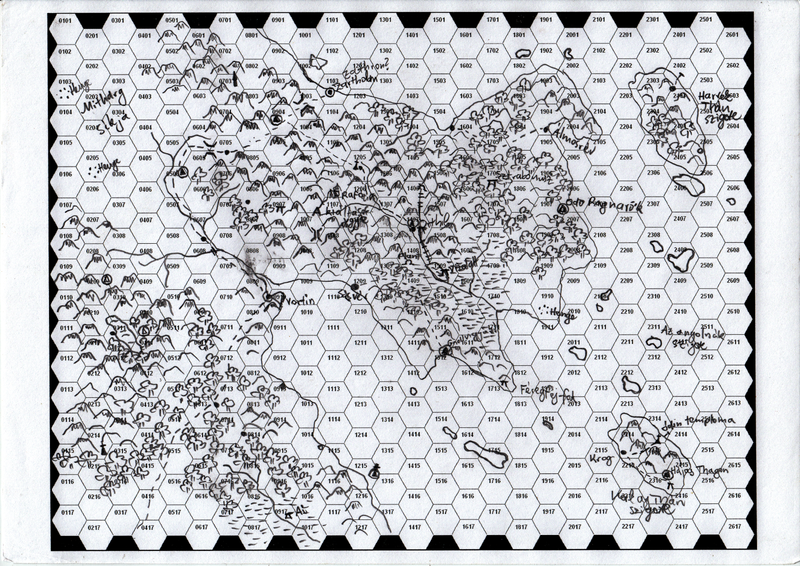 An overland map detailing the mini-setting where the action takes place, with a lot of geographic variety, natural barriers and more/less convenient routes through the wilderness to encourage interesting in-game choices. A few rival power centres, from small city states to villages and strongholds, described in a few handwritten pages each with a focus on how to get into trouble or go on adventures. A few straightforward adventure locations; maybe two or three small dungeons and a bunch of smaller ruins and lairs scattered on the map. Have a bunch of one-page dungeons that fit your tastes? This is one good opportunity to use them. A few organisations who can get involved – religious sects, mercantile guilds, even a rival adventuring party or two. Rumours to guide the action and give the players ideas, as well as a few larger-scale legends which can become central mysteries, to be uncovered gradually. Your favourite game procedures and optional rules to make adventuring in your setting a constant challenge. That’s it. It seems daunting, but it doesn’t have to be written all at once – it just has to be written a bit differently than many people are used to. Some of the things I have learned about running more and less successful sandbox campaigns highlight these differences. First, sandboxes benefit from having a bunch of smaller, modular scenarios instead of a single large one. Sure, a tentpole dungeon or a central city state can come in handy, but the campaign framework relies on variety above everything else. Second, while adventures are often written with strong implications about the way to use them (which is fine in an episodic game), sandbox gaming is at its best when there are several ways a party of adventurers can come in contact with one of its components. A Viking village can be a place to rest and resupply, a place to pawn off a shipload of ill-gotten loot, a place to get into trouble at the longhouse, or a place to infiltrate on a stealth mission. This feeds into the third point: reusability. When campaign elements return again and again, it builds continuity and opens up new ways of looking at and dealing with things. You don’t just fight a group of armed men: you fight the Jarl’s henchmen, who have been on your trail ever since you freed those slaves. As things interact with the characters and each other, the whole sandbox grows. Although continuity and connectivity are also important in other campaign structures (such as the journey or quest), they come to life in a bounded setting – one limited by geography, the players’ interest (meeting lots of demons in a demon hunting campaign), or any other factor. Six, even relatively simple ideas can create odd combinations. 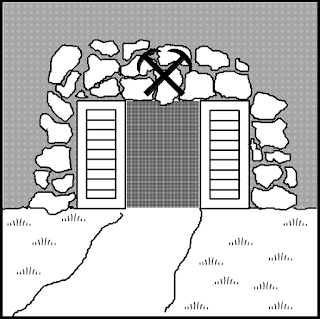 Much of the value of the sandbox lies in the space between individual setting elements, and what grows in those gaps. Closeness creates links, and links hint at interaction. The villagers living next to the giant ant hill likely want to have them driven out. 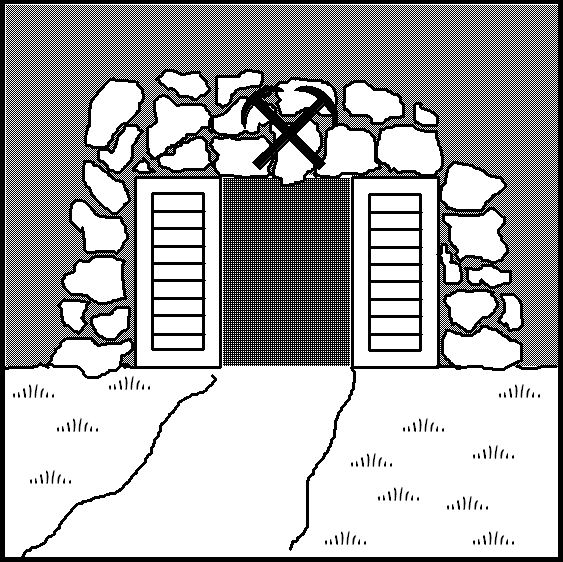 The 5th level Fighter and his retinue occupying the tower in the forest may have designs to rule the village, and they may be intrigued by the ruins of the overgrown amphitheatre nearby. Seven, travel is an important part of the experience. Travel helps tie things together, helps to establish proximity and distance, and the game procedures you use for travel add to the content. 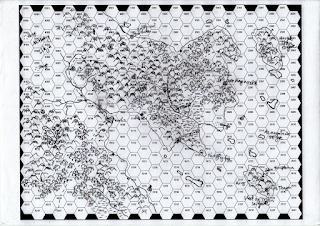 I’d be using the campaign hexagon system, although pointcrawls and other approaches can work well. There are both advantages and disadvantages to going into detail when it comes to places, people, organisations, etc., but at the beginning, having most things at the level of broad strokes makes most sense. It is always possible to expand on an idea later – but it is useful to have that idea there in the first place to allow it to connect to other ideas and grow. Looping things back to existing sandbox components creates cohesion and generates new adventure opportunities like nothing else. Slaughter in the Salt Pits: A village and its salt mines, ruled by an evil Cleric and his minions. One of the central places; the players ended up taking it over in a bloody uprising. Wolfstone: A rival mining village, ruled by lawful fire-worshippers and home to a wizardess and a trading post where many interesting items would turn up. Armagh: Viking village, two pages. Caravans: A description of a few major merchant caravans encountered on the peninsula. Taxes and Death: When you conquer a small village, the random encounters come to you. Guidelines for that sort of thing. Strabonus: The resting place of an antique warlord, now inhabited by raiding gnolls. A dungeon that became prominent later in the campaign. Attack of the Plant Monsters: A swamp-filled valley containing monster lairs – the kind of place to set the objectives of a small mission. Gnollwatch: A few pages about a keep dedicated to driving the gnolls out of the peninsula, mostly turned to brigandry (barely detailed). The Smugglers of Cliff Point: Hidden caverns ruled by a band of smugglers. Prince Rafazin, the Lord of the Griffins: Mountain aerie of a prince who would go raiding with his pack of trained griffins. Zarthstone: A small town dominated by the cult of Pallas Athene and a fair dedicated to her name, but possessing a seedy underbelly. Multiple mini-adventures involving thieves. The Castle of Odo Ragnarök: Castle inhabited by vampire lord served by a bunch of corrupted crusaders (barely detailed). The Temple of Odin: Site of a badly failed assassination mission (barely detailed). Underwater: A town swallowed by a lake (never detailed beyond concept phase). Taman Hal, the Invisible Tyrant: A major legend about an opulent undersea pleasure palace / tomb (concept and rumours only). That looks like a lot of stuff and a lot of work, but in truth, it reflects only the endpoint of a campaign arc. By the time the sandbox grew to its full size, it had fairly well developed political conflicts, local history, legends, recurring characters and even a sense of coherence (despite the Wilderlands’ tendency of gleefully throwing together Greeks, Vikings, Horse nomads, Tolkien, and a lot of even stranger things in an eclectic mess). Just like Rome, it was not built in a day, neither did it emerge fully formed from my head: at any given time, the materials in my hand were usually “just enough” to escape forward before the players would catch up and unmask me for a fraud who doesn’t know what is at the end of that back alley. Some of the notes were detailed after the sessions where the players encountered them, and more stuff remained in the form of very rough concepts that never got developed because the players didn’t encounter them. It is all a bit of a mess that barely fits together, and was mostly written in a hurry, or on the long train rides between my two homes. It is a bunch of disparate elements thrown together. When I say “dirt cheap”, I mean it. Once upon a time, around 2006, I thought about turning my sandbox into a full-fledged supplement (Blackmarsh before there was a Blackmarsh), upgraded, enlarged and the serial numbers filed off. It never happened, except for the publication of some of the individual components through the years (it was not the first case either). I often wondered why – laziness? Moving on to other ideas that excited me more? Too many contradictions within the mini-setting I could no longer reconcile? All of these reasons had played a part. But I now realise it was something else. The magic of that campaign was found in that hard to define dynamic quality which had linked otherwise fairly static and often generic elements, and assembled them into something much more than the sum of its parts. It was really about the way individual elements interacted and collided as the characters ploughed through them. It was about immediacy, unexpected things, and our mutual willingness to play around. And that’s why the supplement wasn’t, and will never be made. Perhaps there will be something else instead; something encouraging the collision of many different, seemingly incompatible ideas, a grab bag of mosaic pieces everyone can throw up into the air to create their own wild patterns. “Creativity aid, not creativity replacement.” Shake it up, repurpose for yourself, and don’t take it too seriously. YOU RULE! YOU ARE ONE OF THE DARK MODDERS! I AM NOT WORTHY! People often ask why I don't restart my old campaign. And the reason was it was created by the old players and without them it just wouldn't be the same campaign. It had been created by them for them. It wouldn't really make sense absent them. New players need a new campaign that isn't haunted by the ghosts of the old. "Haunted by the ghosts of old" - that's well put. I avoid restarting old campaigns for similar reasons, although I do reuse ideas and adventures. Also agreed on the group defining the campaign. Players come and go, but it is the continuity and shared memories among participants that sustain the common experience. The campaign discussed in this post ended when some of the key players moved away (some as far as the UK), and there was no longer a common ground to build on. We could have recruited a bunch of new players, but it would have been a completely different experience. The open table idea (like the original Greyhawk campaign, or some of the games people have tried in FLAILSNAILS) seems to contradict this, but I don't have enough experience with it to comment. I made something for sandbox games. It's kind of a web-based GM assistant. You make your map and you can attach notes and icons to each part of the map.